We got up at 5:30 am. Yes, even Linda. 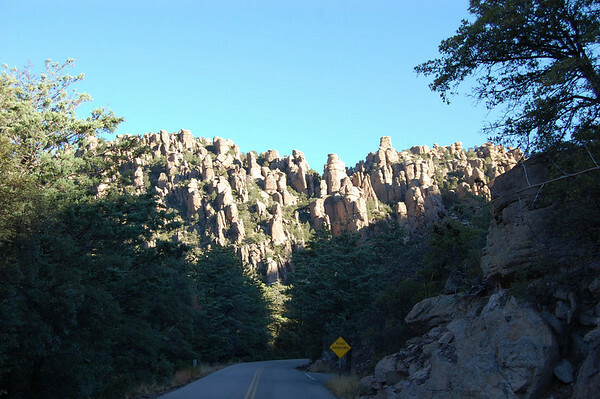 The plan was to be on the road by 6:30, gas up, and arrive at the Chiricahua National Monument visitors center when it opened at 8:00. 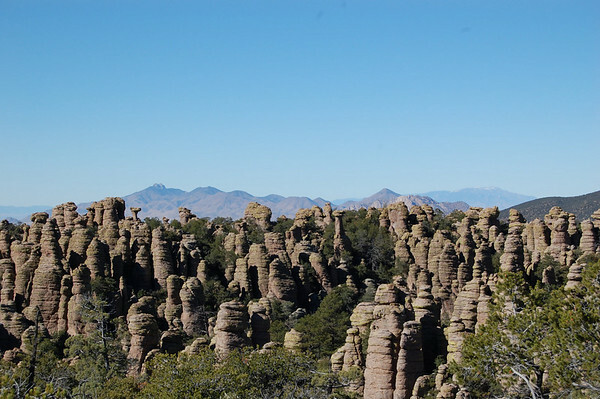 The Chiricahua (cheer-i-cow-a) National Monument is located about 37 miles southeast of the town of Willcox, AZ. We dressed in layers and filled our CamelBaks with water, snacks, more layers, and emergency supplies. Linda boiled some eggs and made some peanut butter crackers last night. We added some trail bars, beef sticks, and fruit. Once we passed through the park entrance, we saw lots of white-tailed deer along the road. 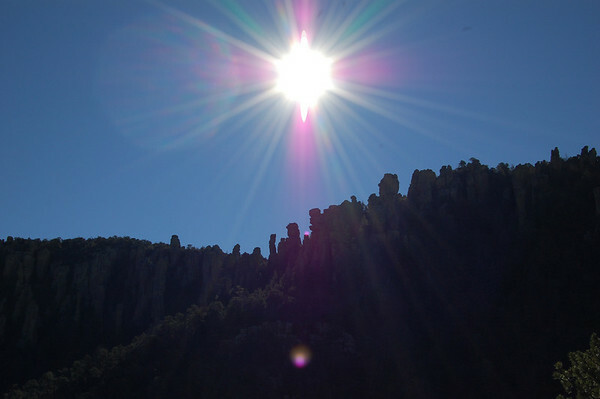 The park sits in a canyon and the sun had not yet risen above the canyon walls. We arrived at the visitors center right when it opened. We were going to cover as much ground as possible today, so I had two possible hikes selected. One was a mostly downhill hike of about 7.3 miles that misses a couple of highlights. There is a hiker shuttle at 8:30 each morning from the visitors center. It takes you from 5400 feet up to the end of the 8-mile park road at about 6800 feet and drops you off. Then you can choose a variety of trails and end up back at the visitors center at your car. The other choice was The Big Loop which could be as long as 9.5 miles but covers most of the accessible highlights and habitats of the park. You drive yourself up to the end of the road and eventually loop back to your car. 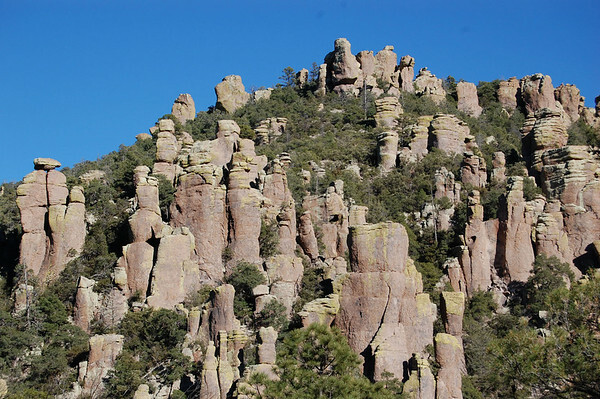 It's more strenuous with numerous elevation changes, but you see more variety. 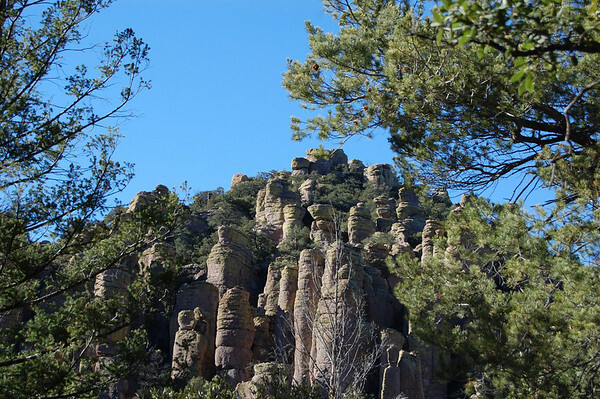 After talking to the ranger, we settled on The Big Loop but decided to cut out a one-mile side trip that would make our hike an ambitious 8.5 miles. We haven't been doing as much hiking as we would like, so we knew this one would be a challenge. Before heading up the road, we watched an eight-minute video about the park. 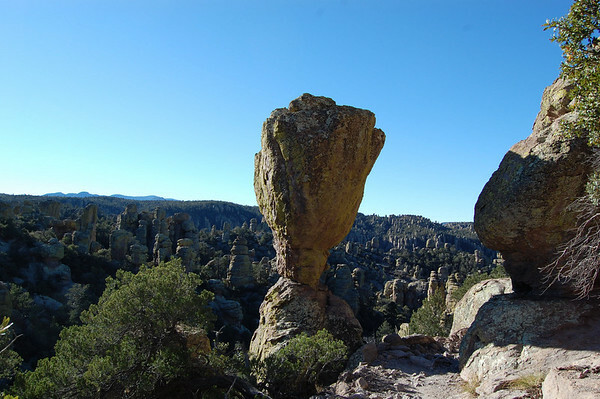 It always helps us get our bearings about the history, geology, and why the park exists. We left the visitors center and started up the road. 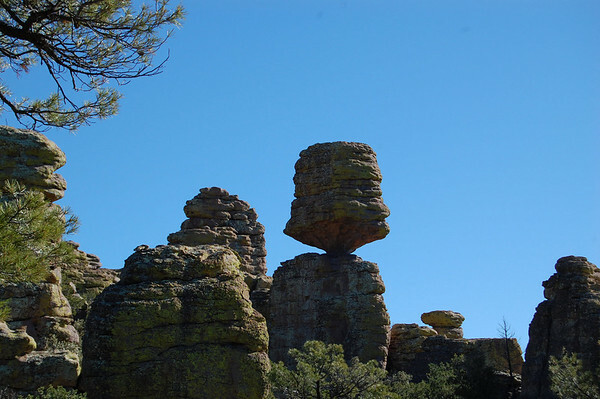 We passed the campground and started to get a glimpse of the special rock formations. We passed our turn and went to the end of the road - Massai Point. I got out and snapped a couple of pics of the area below where we would be hiking. We backtracked down the hill a little to the Echo Canyon parking area where we would begin and end our hike. 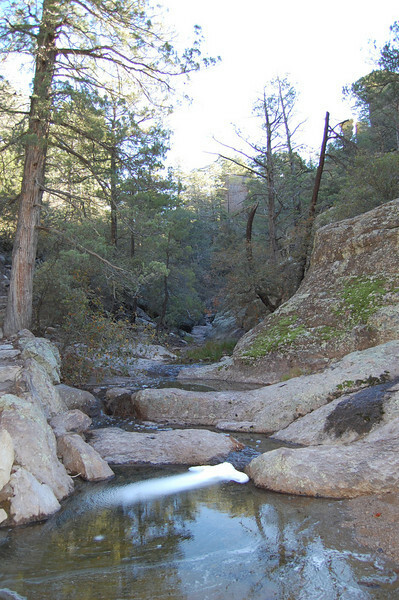 We started down the Echo Canyon trail where scenes like this were common. 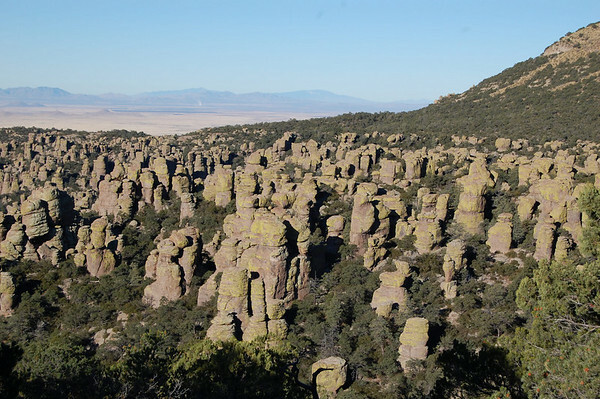 Though not red rocks, they were covered in bright yellow-green lichens which gave them plenty of contrasting color. 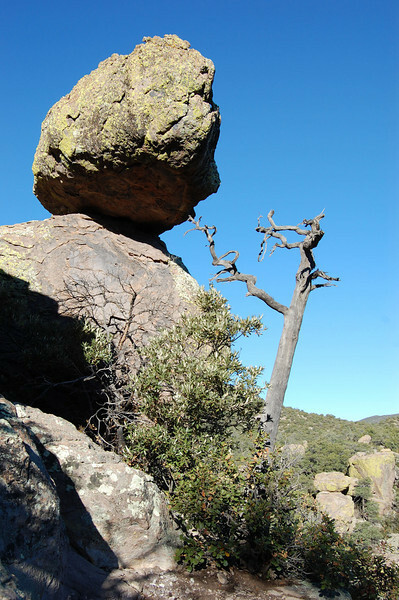 Lichens are the result of a symbiotic relationship between fungus and algae. They come in many forms and colors. Because they get their nutrients from the air, they are a great indicator of pollution or the lack thereof. The more lichens, the cleaner the air and this place is loaded with lichens. 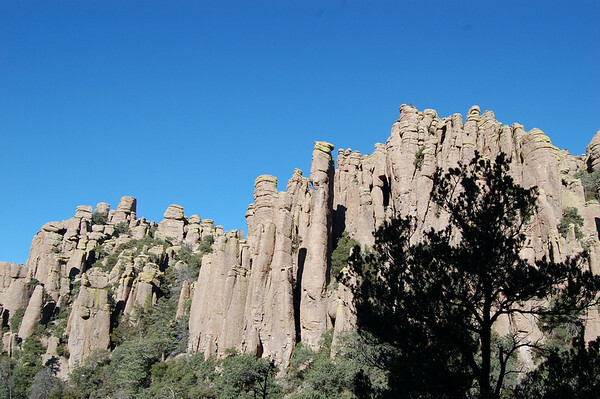 We continued on down the 1.6-mile Echo Canyon Trail where there were more great views of towering pillars in the early morning light. The descent down into Echo Canyon gave us a much different perspective. Once in the canyon, beside the creek where the sun had not yet penetrated, it felt 20 degrees cooler - pretty chilly. Eventually the trail left the creek and came out on a ridge where it felt good to be back in the sun. And the views weren't bad either. I did a point and shoot across the canyon to the side where the sun was rising just to see what I would get. The Echo Canyon Trail ended. We had gone from 6780 feet to 6330 feet. 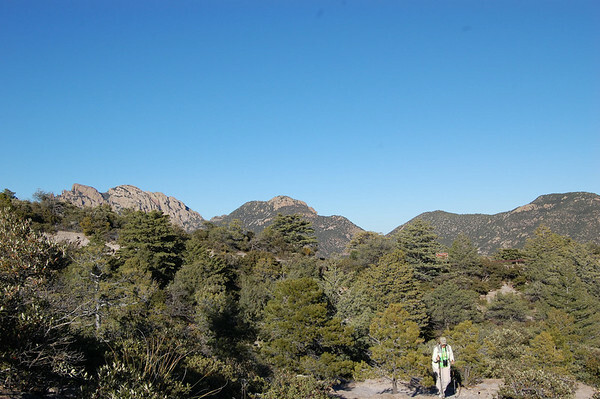 We then picked up the Upper Rhyolite Canyon Trail which descended another 1.1 miles to 5980 feet. That trail left the ridge and went down to another creek bed. On the way, we saw a few birds. It was between migrations, so we didn't expect much in the way of numbers or variety. Near the creek crossing, we noticed several critters scurrying about. They turned out to be the large, bushy-tailed Chiricahua Fox Squirrels. 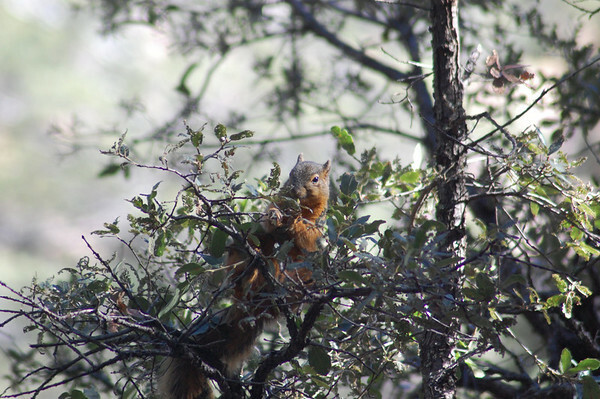 It was hard to get photos, but these orange-fronted squirrels were beautiful. And they only exist in these mountains. Linda noticed that their orange fur exactly matched the color of the pine needles on the forest floor. That was the highlight of our wildlife viewing for the day. It wasn't great for animals, but we can never complain about seeing a new species. 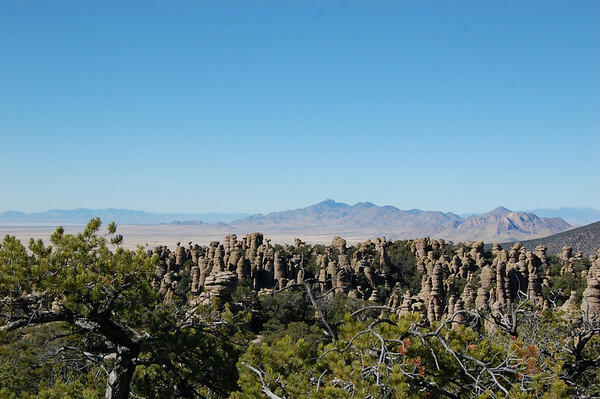 At the end of the Upper Rhyolite Canyon Trail, we picked up the Sara Deming Trail. That was a gradual, uphill 1.6 mile climb from 5980 feet to 6860 feet. I was a little concerned about the nearly 900 foot elevation change. But the trail would climb a little then level out. That pattern repeated and it wasn't too bad. Plus we were on the shaded side of the ridge, so there was no worry about overheating. 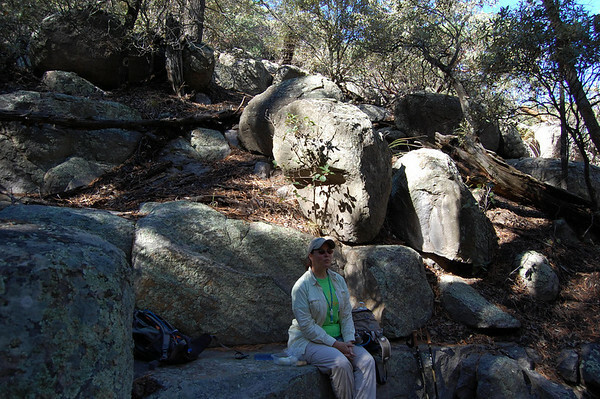 A little over half way up, we found a nice flat rock where we stopped to rest and have a snack. That energized us and we carried on. 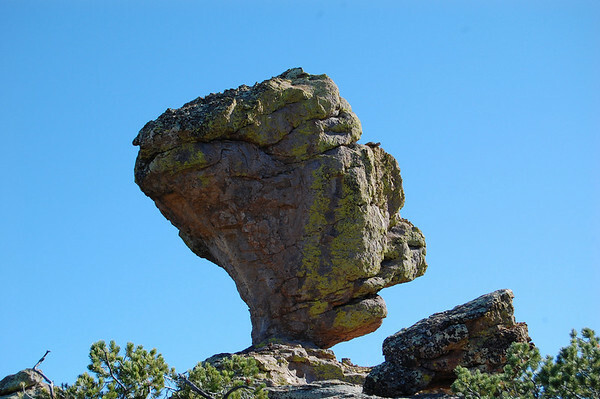 Near the end of the trail, we got our first look at Big Balanced Rock. 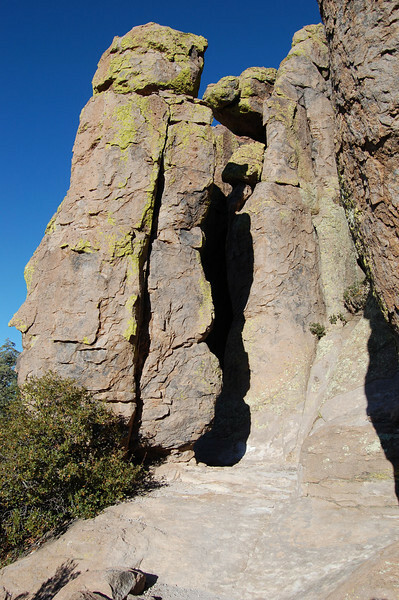 We climbed just a bit farther from there to where the trail ended at the Heart of Rocks Trail Loop. 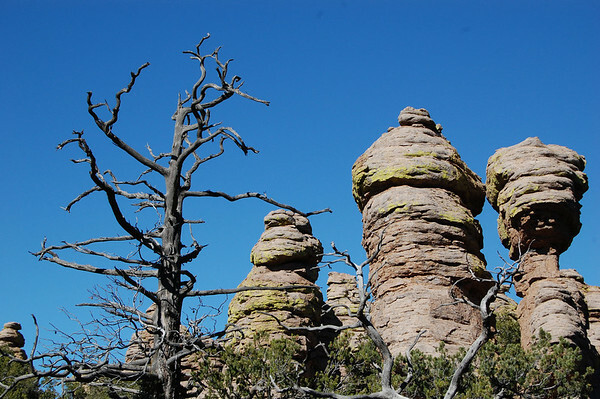 I had read that the Heart of Rocks was the best part, but the ranger told us the loop was strenuous. So we rested again before taking on the 1.1. mile loop. 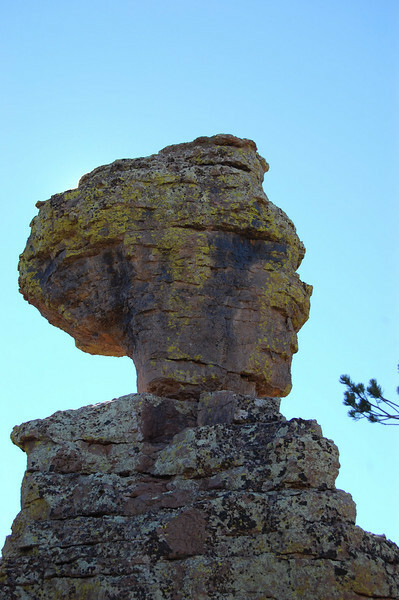 Here's another look at Big Balanced Rock from the Heart of Rocks trailhead. After resting enough, we started the Heart of Rocks Loop. There was some climbing and lots of rock steps, both uphill and downhill, but it wasn't as bad as the ranger made it sound. 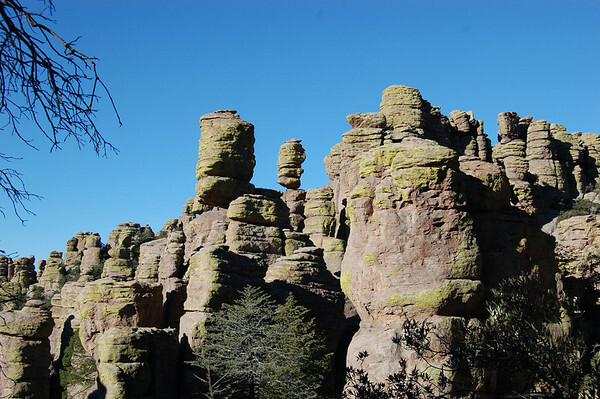 Within the Heart of Rocks are several named formations. During the whole hike, Linda was spotting and naming the rocks. Here, many were named for us. This didn't have a name, I just liked the tree between the rocks and the bright blue sky background. This one was called Old Maid (she's facing right). There were some great views as we made our way around the loop. I didn't see a name for this one, but I'm calling it Bart Simpson. This is Punch & Judy. I thought Punch & Judy were puppets, but Linda & I had to look them up to confirm. 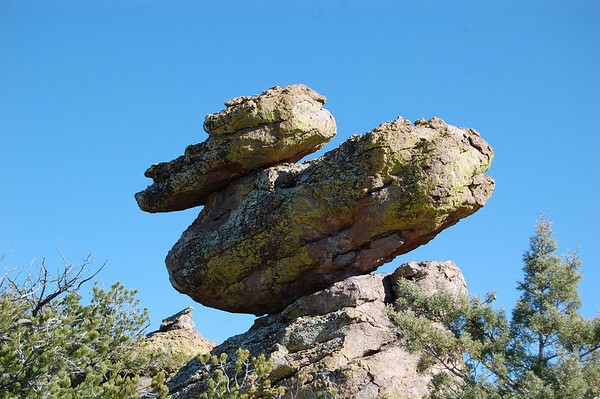 One of Linda's favorites - Duck on a Rock. 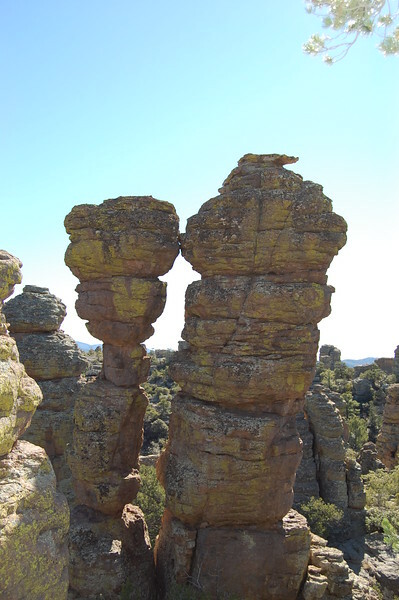 Then we have Kissing Rocks. A dead tree photo from the other side of Kissing Rocks. We exited the Heart of Rocks Loop with a smile. 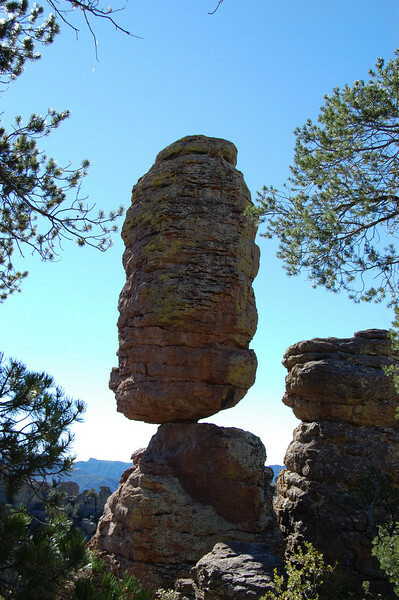 That put us on the Big Balanced Rock Trail. It's a one-mile trail with only a couple hundred feet of incline. 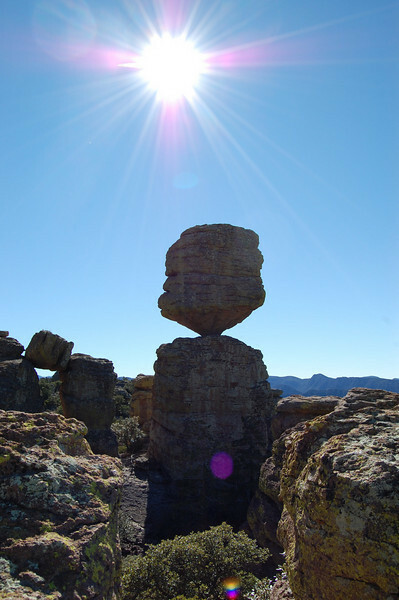 I took one more backlit shot of Big Balanced Rock before moving on. As we climbed, we looked back at another fabulous view. At the highest point of our hike, a little over 7000 feet, we met Tammy & Mark and their baby girl from British Columbia. They were resting and admiring this view. We stopped to chat for a little while. They were on an eleven-day vacation. They had flown into Phoenix and rented an RV for the first time. It was a good rest for us and we talked longer than expected. They like nature, so we got information on where they had been. They were fascinated with our lifestyle, so we answered questions and gave them a card. Besides them, we saw only two other people during our six-hour hike. 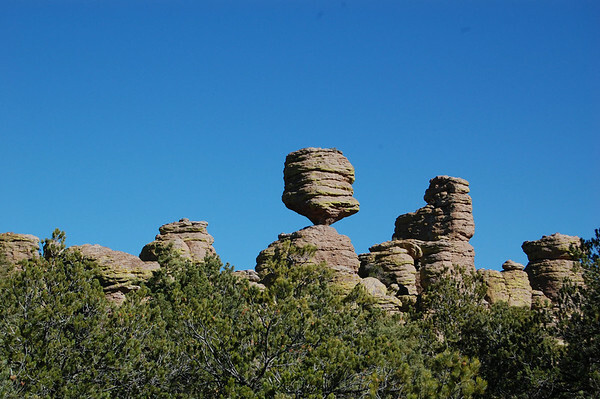 The Big Balanced Rock Trail ended at the Inspiration Point Trail at 7010 feet. Inspiration Point was the one-mile side trip we chose to skip. The ranger said "It's not very inspirational". 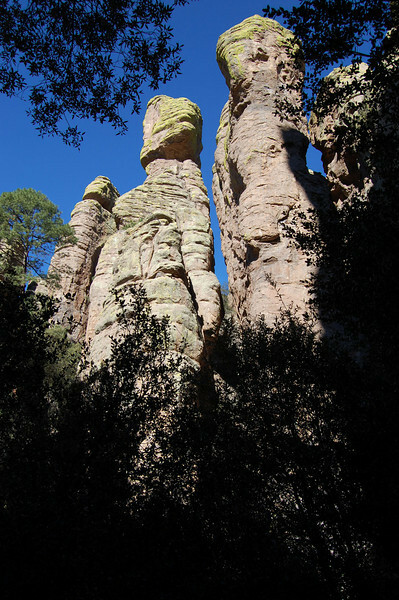 From there we took the Mushroom Rock Trail. 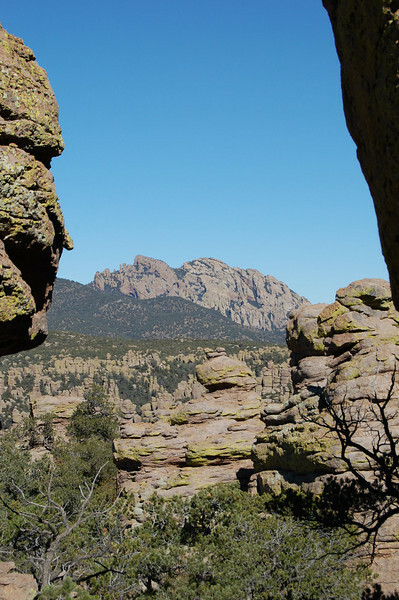 It is a 1.2-mile trail which descended from 7010 feet down to 6400 feet. It helped us pick up the pace, but it was downhill the whole way with no level parts and our knees were feeling it at the bottom. That part of The Big Loop was completely shaded until near the end where we got a view of the late afternoon light on the rocks. Ah, we had one final leg. It was .7 miles uphill on the Ed Riggs Trail and then .2 more miles to the parking lot. However, we had to go from 6400 feet back to our starting elevation of 6780. While asking Linda if she had another mile in her, I snapped another shot of rocks. She did great, but started lagging way behind near the end. We got in the Jeep and had our last snack. Any thoughts I had about taking some of the shorter trails on our way out were quickly nixed. It was a great hike. I really enjoyed it and would probably put it in our top ten up to that point. We practically had the whole 8.5 miles to ourselves and the scenery was excellent. 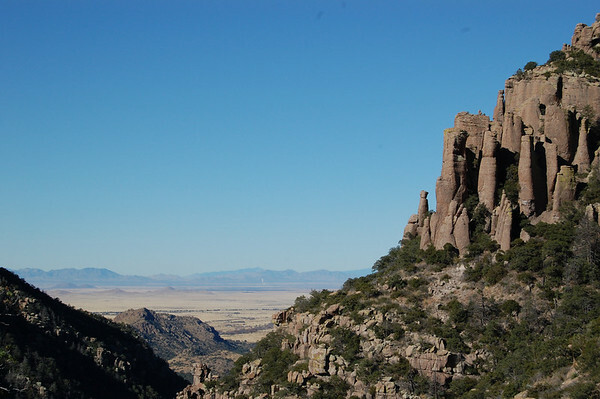 Still, I kept thinking how much better it would be in the spring with all the creeks flowing, the flowers in bloom, a higher sun shining into the canyons, and the hordes of migrating birds. Of course that's why most people come in the spring rather than the end of November. But avoiding the crowds certainly has merit. 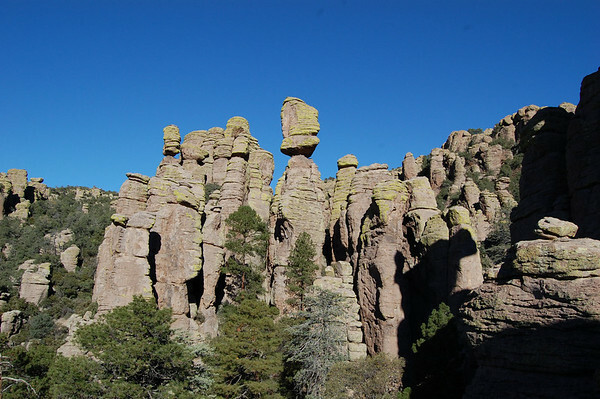 It was a fine, fine day in the Chiricahua Mountains.